The Strawberry Fayre design from Julie Dodsworth combines a traditional looking floral pattern with a very modern polka heart design. 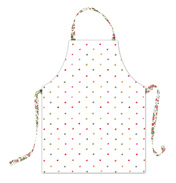 Items such as the Tea Cosy and Cotton Apron are packed full of pink, green and red roses on a leafy, dotty background whereas the PVC apron and Double Ovenglove combine both the rose design and the polka hearts to create a bright funky design. 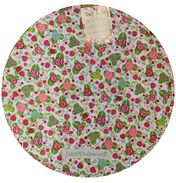 Also available in this range are a set of gorgeous Cake Tins. Each tin has a slightly different variation of the Strawberry Fayre design and they’re ideal for storing not only cakes but your favourite biscuits too! There’s also both a Mini Gusset Bag and Medium Gusset Bag. This design is just too good to keep in the home, we want you to take it out shopping with you too! 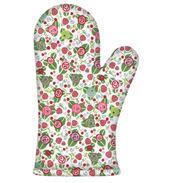 Take a look at our range of Julie Dodsworth products featuring the Strawberry Fayre design, there’s something for everyone, both in the kitchen and out doing the shopping.